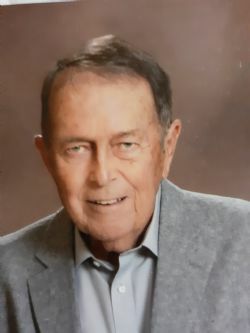 Mr. Edwin Hares, age 84, of Mountain Home, Arkansas, passed away Saturday, February 9, 2019, at Baxter Regional Medical Center in Mountain Home. He was born December 27, 1934, in Auburn, New York, to Leland Edwin and Lottie Bernice Amidon Hares. Mr. Hares served in the United States Navy achieving the rank of Senior Chief. He earned a Masters Degree in Geology at the University of Memphis in 1974 and was an environmental geologist. He moved to Mountain View, Arkansas in 2005 from Atoka, Tennessee and then to Mountain Home in 2015. He was a member of St. Peter the Fisherman Catholic Church, the Fisherman Council Knights of Columbus and the N.R.A. He enjoyed building, hunting, fishing and camping. Survivors are: his wife, Margaret �Peg� Hares: of the home; four sons: Ted (Jean) Hares, Leland (Celia) Hares, Randy (Nicky) Hares and Jayson (Rebecca) Hares; three daughters: Paula (Jerry) Lewis, Pamela (Patrick) Walkaup, and Karen Weinman; three stepchildren: Margaret �Peggy� (Ashley) Owens, Kathleen (Ronald) Kohlbrand and Matthew O�Connor; and fourteen grandchildren. He was preceded in death by his parents and two sisters: Nancy Beno and Joan Marinelli. A Funeral Mass will be at 10:00 A.M. Saturday, February 16, 2019, at St. Peter the Fisherman Catholic Church with Reverend Norbert Rappold and Reverend John Lewandowski as celebrants. Entombment will be in the Columbarium of St. Mary�s Catholic Church in Mountain View at 10:00 A.M., Saturday, March 2, 2019. Memorials may be made to the Knights of Columbus or Wounded Warriors. Roller Funeral Home is in charge of arrangements. Visit our online guestbook at www.rollerfuneralhomes.com/mtnhome.